Text and photography © Marvin Bartel, Ed.D. These are drawing lessons that make the hard stuff easier. Students gain confidence doing real observation and expression. No copy work is involved. I remind students that the purposes of practice is to make things easier and better. Learning to see size and scale relationships are one of the learning challenges when we learn to draw from observation. Older children can learn to do sighting by comparing measurements taken by extending a stiff arm forward and using the pencil to measure sizes and distances and comparing them. Students can also use viewfinders (including those with grids made with black threads). 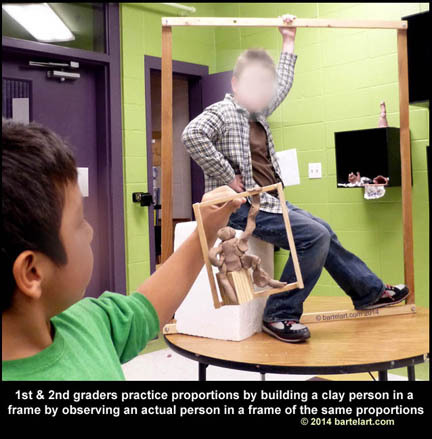 This practice session uses an actual frame around the person being observed to make it easier for children as young as first grade to become aware of the size relationships. Additionally, each student uses a small frame that has the same aspect ratio as the large frame being observed. LEFT: Each student has a small frame of the same proportions as the life-sized frame in the background. The frame makes it easier to become aware of sizes relationships. After making the clay figure, the students draw the figure on paper that already has the frame drawn on the edges of the paper. They work on paper that has been cut to the same aspect ratio as the life-sized frame and the same size as the small wood frame used for the clay figure. 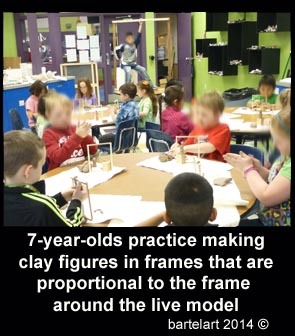 ABOVE: A first grade student compares his clay figure with the actual model sitting in the frame. 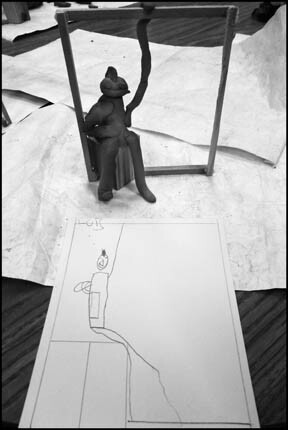 ABOVE: A first grade drawing based on her clay sculpture that was based on the model sitting in the frame. Each day they draw one practice drawing of a self-portrait directly on a mirror using the type of felt tips used for overhead projectors (these marks wipe off with moist paper towel). These drawings can be traced onto typing paper. Each day after making a practice self-portrait, finish the period doing figure drawings (see below). After at least five sessions of practicing directly on mirrors, move to using the mirrors for reference for a self portrait painting that can take several periods. Instead of giving prior instruction such as how high the eyes are in a face, I ask the students to tell me how high the eyes are in the face. Practicing Three Ways to Draw a FIGURE. Each day, after a self-portrait practice, practice figures drawing by the three methods below. Use Blinder Buddy helper on pencil so the drawing is not seen while edges (contour) of figure are drawn. Only look under the drawing helper at when starting a new line. - Pose the figure in an active athletic pose with slanted and extended arms and legs. -Add pieces of tape at each joint of the figure to give structural emphasis to the model. - Work on large brown or white wrapping paper. - Use the side of a piece of dark crayon, Conte crayon, or synthetic charcoal. Anything that is very bold. - START IN THE CENTER of body and very rapidly shade in the whole figure with VERY fast gestural hatching. - NEVER LIFT the crayon from the paper. Keep it in CONSTANT MOTION but vary the pressure. Fill in a bit of the body, move to a leg, to the head, to an arm, etc., never finishing one part before all parts are started. Keep building up all parts until all parts are finished. Finish in two minutes or faster. Use high visibility pink or orange very thin plastic ribbon from building supply stores (used to mark stakes during construction). Pose figure in active athletic pose. Wrap with ribbon. Tape it in place. Draw ONLY the ribbon - not the figure. SAFETY NOTE: Use only thin plastic ribbon that can break very easily. Use only with adult supervision. Do not tie knots. Fasten ribbon with pieces of tape. drawing helper to conceal paper during drawing. a mirror about 8 x 10 inches. Get the least expensive mirrors cut by the local glass company and tape them with duct tape to 9 x 12 inch pieces of foam core. Cover all sharp edges with tape. Hinge another piece of foam core to the top edge with duct tape so they can stand like an easel in front of the student. Student assistants can help make these. After the students have practiced and completed their own expressive original drawings and paintings, and had a critique discussion, they will have a sound frame of reference and strong interest in the study of the self-portraits and figure drawings of famous artists such as Kathy Kollwit, Frida Kahlo, Pablo Picasso, Rembrandt, and others. Search others by artist name, self portrait, and drawing. An Internet image search will find many examples of their work. CLASS CRITIQUES - do NOT skip them. Try this approach. Many art teachers fear the critique session? Many are skipping the critique. How much learning are students missing? Why not try a new approach? Class critique in studio art should never be handled like a debate class. It is not a competition or a contest. Try this approach that can totally change the culture of the studio art class. Try a new approach. Watch motivation and learning double. Include a Rubric for this lesson. Testing in Drawing class. Turning in Grades in Art. ABOVE: Modeling and drawing Invisible Figure Drawing (cross-contour drawing) where only the orange ribbon is drawn. Blinder Buddy is used to hide paper while drawing. SAFETY NOTE: Use only the very thin plastic ribbon that can break very easily. Use only with adult supervision. Only fasten it with pieces of tape. Do not tie knots. (blind cross contour) by a 4th grade student. HELP! Have you tried this lesson or parts of this lesson in your class? Send me an email note with your ideas for improvements, your questions, or other creative ideas that occurred to you or your students as you worked with this lesson.